In what has been one of the greatest, most competitive games you’ll ever see, Lionel Messi reminded the world why he’s the greatest player to ever play the game. Barcelona came out dominating but couldn’t finish any of their numerous chances in a wide open first half, thanks mainly to a Herculean performance by Manuel Neuer. Bayern adjusted in the second, and it looked like the two best teams in the world would have to settle for a draw unless someone stole it late on. Then came Messi. He ripped through the Bayern defense for the first goal you see above. Then, just minutes later, added the coup de grâce. 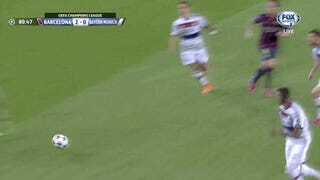 Just look at how he had Jérôme Boateng, a world class defender, on skates. Update: To finish the tie off deep into stoppage time, Messi sent Neymar through on goal for him to add the third and final goal of the match.